A few months ago when I was signing up for my fall semester classes, I noticed my Creative Writing II professor had noted she only wanted us to purchase a poetry book for the class. So, I e-mailed her and asked if poetry was going to be the main focus of the class. After all, I'm a fiction writer--I don't do poetry. She assured me that the class was focused on all types of writing and not to worry. I began her class ready to sharpen my fiction writing skills. But do you know what I sharpened instead? Don't get me wrong--I learned a lot about fiction this semester. But I learned a lot about poetry, too--and that I love writing it. And if you don't normally write poetry, I think you should try it. 1. It's more than it appears. I used to think poetry had to rhyme. I don't know about you, but the thought of poetry not rhyming just sounded weird to me. What was the point of a poem if it didn't rhyme? Needless to say, I'm laughing at myself now. Poetry does not have to rhyme. Actually, most of my poems have no rhyme scheme at all. Poetry is such a beautiful art form, and there's so much more to it than most people think. I had no idea what a sestina was until I had to write one for an assignment last week. 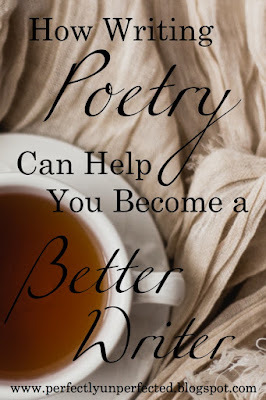 Now I'm amazed by all the different types of poetry that exist, and I want to try them all! 2. It's therapeutic. Poetry has become my new therapy. Like many writers, I express myself best through written words. When I'm experiencing a strong emotion, I tend to write really well. So now when I feel angry, or upset, or lonely, or excited, I channel my emotion into words and just let my heart spill out onto paper. The results always surprise me, and I'm usually left with a poem I'm proud of. Even if you aren't the world's greatest poet, poetry can still be a great therapy to try. 4. It sharpens your skills. Poetry is a skill-sharpener because good poetry includes so many different aspects! Strong word usage, metaphors, description, synsethesia, rhythm, rhyming, etc. My descriptions in my stories have improved so much since I began practicing writing poetry. My word choice is better, my structure is better, and sometimes it sounds like my words are singing. Though it seems simple, the art of poetry has more than meets the eye. With each poem I write, I know I'm growing as a writer and improving my skills without overloading myself with characters and stories and fiction. So if you're feeling swamped or frustrated, write a poem! You might be surprised at what happens.